I think registration process is taking long time as only 45 days left, we should get confirmation letter now, so we can start processing for the visa. 1) People have started receiving their confirmations for Lisbon. 2) There is no facility desk in any JK for Murids who want to go to Lisbon but do not know how to register online. 3) It looks like the Lisbon event is reserved for those who speak English, are computer literate and have access to the Internet. 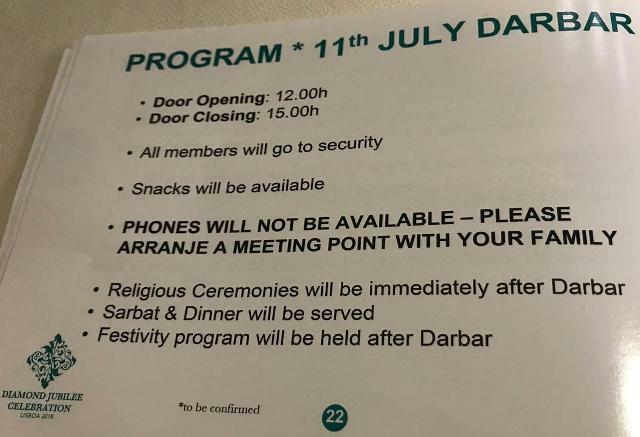 Lisbon Darbar could have been open to all Murids regardless of language, age, literacy level etc with a minimum of good will and competence from the organisers. we have applied for our family. family head as mother.all the details are correct but still its pending.i dont knw what to do as our health insurance and tickets and booking are confirmed.there is no contact no given on the site for query? Just be patient, you will get your confirmation and if not, you will still be able to have your card by showing the pre-registration number in Lisbon. You can not be held responsible for the mismanagement of the registration process. Once our Registration has been validated are there more steps for registration or no. We were asked to indicate how we are traveling and on what days after Validation, just wondering if there will be more information needed to provide. I think they want to have an idea on when people are coming and how many will be there each day, this is probably for planning the events. I don't think they will need or ask other info. I have been told people have a hard time sending their flight arrival info. Either their server is overload because too many people are accessing it or there is a bug in the programing. I’m sitting on the airplane thinking about the last several days – incredible, amazing, crazy days filled with meetings, discussions, site visits, planning, getting to know new individuals and reconnecting with old friends, not to mention the warm hospitality of the Portuguese Jamat. It’s the strongest sense of 2007 déjà vu and it’s hard to describe how lucky I feel finding myself in the midst of these brilliant minds and with a part to play in this historic event. While a lot of information will be officially released to the Jamat in the coming weeks, I thought I would share some of my experiences and observations as a first time visitor so that those of you making the trip may hopefully benefit. Arrivals: If you are traveling in a group, try and organize an airport transfer beforehand. When I arrived, there was a line-up of about 500 people waiting for taxis and it seemed like it would be an unbearable wait after a long flight. Uber is available, though again, who knows what the situation will be during the summer rush. I ventured into the Metro but with luggage, all signage in Portuguese and being unsure which line to take or where I was heading, I didn’t think this was a smart choice. There are also shuttles that go into the city with stops at major hotels but with the ticket machine out of order and no buses in sight, I was stuck. Eventually I found the Tourist Information Desk inside the arrivals hall. They sell taxi vouchers and the driver is there immediately, so this is a good last resort. A taxi costs about 12-15 Euros into the city centre (depending on traffic) while the Tourismo taxis cost a flat rate of 23 Euros. The City: Lisbon is very compact so don’t be too worried about where to stay; everything is close by. The venue for all the events, as well as the Ismaili Centre, are only about a 15 minute drive from the airport (or from anywhere in the city). Taxis and Uber are cheap compared to other European cities, so assuming you can find them during peak time, you should be fine. There is also a Metro but I didn’t get to explore that. There are some beautiful, colourful, culturally rich neighborhoods – do take the time to go explore. I wandered around Rossio, Avenida da Liberdade, Bairro Alto, Principe Real and Alfama in the few free hours I had and they were all great. Please bring comfortable, flat walking shoes with good grip. The streets are cobblestoned and Lisbon is very hilly, so the sidewalks can be very slippery even when dry. Also make sure you have appropriate and cool clothing, a hat and sunscreen – temperatures can reach 35°C and above in July. Communications: While Wi-Fi is generally available for free in most places, getting a local SIM card is easy. Vodafone has one for 10 Euros that covers 3GB of data and bundled minutes of local talk time, in addition to 10GB for Whatsapp and social media apps. Do make sure you bring an unlocked phone if you are coming from the West. Given the large number of people that will be around, get a couple of SIM cards in case you need to stay in touch with family or friends or get lost – you will also need it to get around. Things to do: There are a host of exciting activities, concerts and performances planned, in addition to the Art and Film Festivals. Don’t think for a moment that you will be bored or need to book tours to kill time - you will have lots to see and do all week so make the most of it and try to re-connect with all those coming down from around the world. Also do not miss the opportunity to see the Ismaili Centre – it is stunning. For the shopaholics, the malls are open till midnight everyday (sorry gentlemen, get that extra limit on the credit cards). Centro Vasco da Gama is adjacent to the Festival site and Centro Colombo is also one of the largest Malls in the city and easily accessible. Food: Food is cheap and very good. By the time you leave, you will be living and breathing pasteis de nata custard tarts, frango peri peri chicken and bica espresso coffee. I didn’t get the chance to try any seafood but this is also supposed to be amazing. Language: It would help if you learned a few basic Portuguese words and phrases. Many shopkeepers, taxi drivers and restaurants don’t speak English. I hope these few tips help you with your planning. Stay tuned to all the official Ismaili web and social channels for things you will need to know. Do let me know if you are coming – it would be great to connect again. And if you are still on the fence, close your eyes and just go book that ticket! “I wish I had come” is not acceptable. There, I said it. See you in Lisboa this July! After validation from national council, i got a mail that your registration is accepted. For visa purpose this email should be submitted or any other letter will be received ?? The first International Jubilee Arts Festival will be held from July 6-9, 2018 in Lisbon, Portugal. During the historic four&#8208;day, multidisciplinary arts event, artists, patrons, and volunteers will celebrate some of the best artistic talent from across the global Ismaili community. The International Arts Festival is a unique opportunity for the Jamat to experience our rich cultural traditions and plurality. 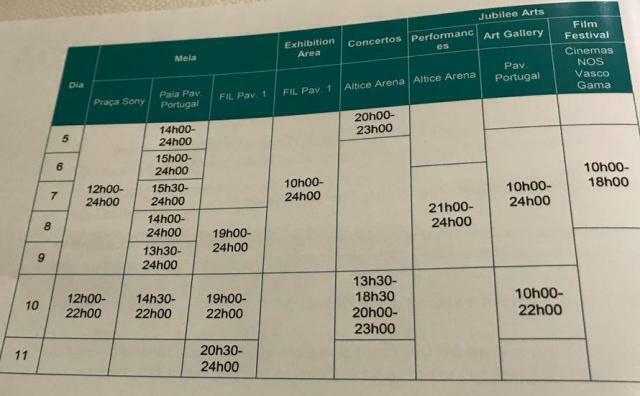 Altice Arena in Lisbon will host the International Talent Showcase; NOS Cinema within the Vasco da Gama Mall will host the International Film Festival; and the Portugal Pavilion will host the International Art Gallery. After you register for Portugal Darbar your local council will confirm your registration. If all ok you will get a confirmation email from the Registration for Lisbon Darbar team. This confirmation will contain an attachment that you need to print and bring to Lisbon. Also you are required to enter your travel details, the means of transportation, arrival and departure dates. Hearing that so far only 52,000 registered. It is a good number in my opinion. I have previously heard that Hazar Imam said he will do 2 Darbars if there are 100,000 murids. May be many murids like myself do not feel the need to travel after getting their Deedars very recently. 53,000 is a good number considering the size of the Portugal and its jurisdictions size. Volunteers are needed for each activities. If you are going to Lisbon, please do register as volunteers. honestly I tried the first link, it sent me to the second link and the second link just keeps turning. I tried this afternoon, I tried late night, I don't know if the server is busy or if it is a bad programing. No wonder the organisation is a mess. All festivities begin on July 5th. In order to accommodate all of the people we are expecting the jamat is going to be asked to purchase “tickets” in advance for any of the shows or exhibits they want to attend. Ticketing system: When each one of you registered you were given a registration ID. This ID number was given to you once you received your confirmation email. Think of this ID number as your “new name” while in Lisbon. Any tickets you buy will need the ID number and then when you reach Lisbon you will pick up your wrist band that will have all your tickets already in it. Imagine this wrist band as your “all inclusive” band you get when your on a resort. Without the band you can’t get access. You can only purchase 2 tickets per person per event for the entire week. This will allow other Jamati members to also participate. Thus far we have over 47 thousand people registered and anticipated to come. July 7-9: All the above will be open. Talent show cases during the day in the FIL building and/or shows at night in the Alice arena. Please remember that a lot of activities will be happening all at the same time, so try to plan in advance and keep your walking shoes close! The National Council is pleased to share with the Jamat, logistical information pertaining to the Diamond Jubilee celebration, taking place in Lisbon from July 5th to July 11th 2018. The upcoming Mulaqat for the Portuguese jurisdiction Jamat, is foreseen for Saturday, July 7th. 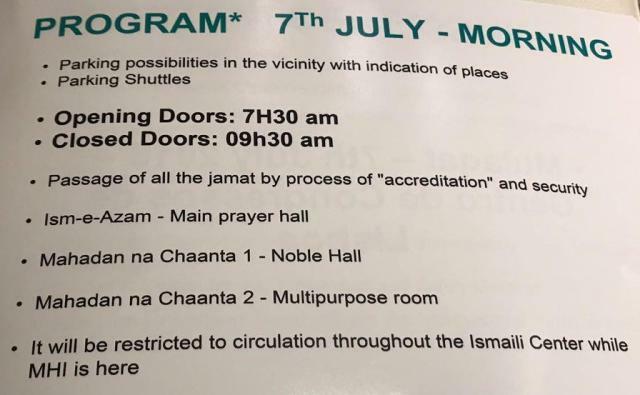 The Religious Ceremonies of Ism-e-Azam and Mahadan na Chaanta, are foreseen for the morning of July 7th, at The Ismaili Center, Lisbon. 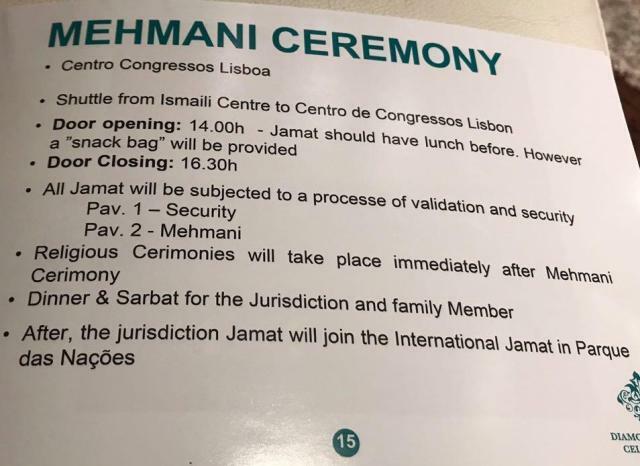 The Mehmani Ceremony is foreseen for the afternoon of July 7th at Centro de Congressos de Lisboa, after which, sharbat and dinner will be served to the Portuguese jurisdiction Jamat. We will continue to celebrate this momentous day together with the international Jamat at Patio Mela, located at Parque das Nações, where will engage in Dandia Raas and other festivities. The collection of access cards for the various religious ceremonies of the Mulaqat including the wristbands for the Global Darbar will be shared in due course. Information regarding the purchasing of tickets for The Jubilee Concert on July 10th, The International Talent Showcase, The International Art Gallery, The International Film Festival and The Rays of Light exhibition, will be available via the Council Office and online shortly. As received, may be true, God knows! Better safe than sorry. Please note : If the registration team does not receive your details by Friday 22 June, they will assume you are no longer able to travel to Lisbon and your registration will be cancelled. Pátio Mela is the Central Hospitality & Entertainment Hub for the Diamond Jubilee Celebration, which will serve as the central gathering place for the attending Jamat. The venue and facilities are designed to create a warm sense of hospitality, inviting social interaction and celebration, while also fostering unity and togetherness. What is the meaning of the word “Mela”? The word “Mela” means an assembly, fair or crowd. It is also an Indian noun used to describe a festival. What is the meaning of the word “Pátio”? The word “Pátio” means courtyard or concourse. In Portuguese, it is also used to describe a place of gathering or assembly. Where will Pátio Mela be located ? Pátio Mela will be located at Parque das Nações, Lisbon, between Praça Sony and the Portugal pavilion, including Feira Internacional de Lisboa (FIL) and the outdoors areas. What is the schedule for Pátio Mela? The opening ceremony for Pátio Mela is on 5 July 2018. From 5-9 July Pátio Mela will be open from 12 PM to 5:30 PM and 7 PM to 12 AM. On July 10, Pátio Mela will open at 12 PM and close at 10 PM. On July 11, the outdoor spaces will be open from 7 PM to 12 AM, whilst the indoor spaces will be open from 7 PM to 2 AM. On this day, the Pátio Mela will extend to all outdoor areas and FIL pavilions (3 of 4 in total), after religious ceremonies and dinner. The show to be held on Stage 1 will be broadcasted to all other pavilions, so that everyone can celebrate in all areas. On this day, a closing ceremony will include festivities such as music, dancing, and other entertainment activities. Note: The schedule is subject to change. Who can visit the Pátio Mela? Pátio Mela is a congregation of celebration welcoming the Global Jamat and their families. Participants can access the facilities with the Diamond Jubilee wristband to be collected upon arriving into Lisbon. Will I need a ticket to enter? Every person must be registered in order to enter the venue. The registration is free and automatic when you register for Diamond Jubilee Celebration. A wristband will be given to you that you should keep with you in order to enter and exit the venue. Children can enter on their own, as long as they have the wristband. However, they will not be permitted to leave the venue alone (age threshold to be determined). What activities can I find in Pátio Mela? In Pátio Mela you will find a great variety of facilities and activities, both indoor and outdoor. Special areas will be set up for children (see below), stages with different performers, cafes and restaurants, interactive performances, a chill out zone, dancing areas, and everything you need to have a memorable experience. What facilities can I find in the Pátio Mela for children? There are plenty of activities for children. You will find a nursery, playground, kids zone, street performers, and many entertainment items, including the stages. These services will be available for children aged 3 to 15 (the nursery will accommodate children under 3). What kind of food can I find? There will be several restaurants and food trucks available in the Pátio Mela, where you can purchase and taste different cuisines from around the world. Pátio Mela is the central hub of the Diamond Jubilee Celebration, and will be open between 5 and 11 July 2018. It will be a gathering space to celebrate diversity, creativity, and community that will be open during the day and night, and will be spread across indoor and outdoor areas. The purpose of the facilities is to provide a space for the global Jamat to come together and engage in activities in celebration of the Diamond Jubilee. Pátio Mela will also have live music and performances on various stages featuring musicians and performing artists from Portugal and across the world. Facilities will be open across indoor and outdoor areas during the daytime and night-time. Please go through Pátio Mela FAQs (above) for details on the schedule including the timings, opening and closing ceremonies, and special services for children and senior citizens. used the Metro everywhere. It’s so good and easy and I believe open until quite late. Very safe. You will see more women at night then men. Try and buy the card (like presto card) from a person instead of machine, as you can get a discount, but it’s really not that pricey at the machine either. And even after the card has no money left on it, don’t get rid of it, as it can be re-loaded. Also make sure not to try to use the same card for both of u. If you make a mistake and load both tickets on 1 card, get the assistance to reverse prior to using. Once u activate, you can’t change and have to pay again. (We made that mistake when trying to go to Cascais, and ended up wasting 20E. Uber is really good there too. Not that pricey. Expo 98 area- Didn’t make it here. Always start the night in Bairro Alto. It's by the tube stop BAIXA-CHIADO. You can even have dinner there if you want. A good time to go would be 23:00/23:30 (or around 21:00/22:00 for dinner). Bairro Alto is basically 3 or 4 small streets with dozens of bars. Make sure to buy a drink in one of the bars and then just walk around and meet people. Always packed and always loads of foreigners. A beer should cost 1.20 and a huge caipirinha or mojito 5. If you want to hear Fado music, I think Café Lusso in Barrio is best known for it, but there are many such places. It’s worth going there. Very lively. Another place with some bars in Cais do Sodré (Rua Cor de Rosa) or Principe Real (near Rato tube station). These are up and coming nightlife areas in Lisbon and slightly more “fancy” than Bairro Alto. When you're in Bairro Alto, Cais do Sodré or Principe Real ask around about where the night is good. Portuguese people will help you out and give you good recommendations, hopefully. recommend the Zomato App to search for good/close restaurant recommendations. Guincho area. This area is a 40 minute drive from Lisbon. Equivalent to what the Hamptons are to New York. Very pricey restaurants (30 – 40 € pp) with an amazing view (Ocean front). Public tours of the Ismaili Centre, Lisbon are available for free, but must be pre-arranged. Tours are generally offered every day, except on Wednesdays. Please also note that a tour must be booked at least two days in advance so that the availability of our volunteer tour guides can be assured. Occasionally a tour may be cancelled due to other programmes and events taking place at the Ismaili Centre. If that happens and your tour is affected, an email will be sent to notify you. Please arrange your tour by contacting the secretariat of the Ismaili Council for Portugal at nationalcouncil@cism.com.pt(link sends e-mail)<mailto:nationalcouncil@cism.com.pt>. The Ismaili Centre, Lisbon is situated about 10-15 minutes from the city centre at Avenida Lusíada nº1, 1500-650 Lisboa<https://www.google.com/maps/place/38%C2%B045%2702.2%22N+9%C2%B010%2711.7%22W/@38.750624,-9.16991,247m/data=!3m2!1e3!4b1!4m2!3m1!1s0x0:0x0!6m1!1e1>. The best way to arrive at the Ismaili Centre is by car, taxi or metro. • Take the blue line and exit at Laranjeiras station. The Ismaili Centre is a 5 minute walk from the station, next to Loja do Cidadão das Laranjeiras (a well known place in the area). • Take the yellow line and exit at Cidade Universitária station. The Ismaili Centre is a 15-20 minute walk in the direction of the Portuguese Catholic University, and is located beyond the university on the opposite side of Avenida Lusíada. Food was great. restaurant is right on the beach, there is a DJ playing great music, and we happened to be there right at sunset so it was absolutely beautiful and the food was very good. Highly recommend it. Lagos..nice city with a beautiful beach called Prai de ana. Has the first indoor slave market in Europe. It’s a really pretty town. Keep driving and you end up in spain. Best place to eat...a city called Guia. Restaurant calles...o rei de frangos. Most popular...expect 30m line ups...order baby chicken...don't miss...close to albufeira. Portimao- town where u can eat the best grilled sardinhas. Around there are beaches with rocs Praia da Rocha. It is not easy to find unless you have Gps. Faro- We went from Albufeira to Faro by Uber. I think it was about 30Eu. Very pleasant drive. Took only 30 min. U can go to the port of Faro and take the boat to go and visit Formosa island which is a natural resort for birds etc. Tavira is a nice medieval town and a place to see. Around nice beaches like the one where u go by train. Praia du Barril, Praia del Rei, etc. Golf courses are really nice. We saw a nice one in Villamoura (old fishmen s port turbed in a big riviera full off big hotels, restaurants even indians and apparently also in Quinta de Lago). Even if you are interested in volunteering to apply mehendi, please fill out this form. If you have not registered as a volunteer we will need you to write NR next to your name. Trying to make sense of the itinerary of our Imam in Lisbon. Please confirm if true. Thanks! During this visit, he will open the Headquarters of the Imamate on Rua Marquês de Fronteira and will give the Grand Diamond Jubilee Darbar to the world Jamat. He will also meet with the government and is expecte to address the Parleiment but we could not confirm yet. On 7th and 8th, Mowlana Hazar Imam will be performing religious ceremonies with the Jamat under the jurisdiction of the Portugal Council. 2018, Monday July 9th : H.H. The Aga Khan, together with his delegation, will meet with the President. Before he leaves, he will attend a Guard of Honour Ceremony. There will be a Press Conference in Sala das Bicas. The same day he will be hosted at night for Dinner at the Palace of Queluz (15 minutes from Lisbon) with the President of Portugal. 2018, Tuesday July 10: Eduardo Ferro Rodrigues opens the exhibition "Ideals of Leadership: Masterpieces from the Aga Khan Museum Collection". 2018, Tuesday July 10: Mowlana Hazar Imam to address the Portuguese Parliament. After lunch, H.H. The Aga Khan will return to the future Headquarters of the Ismaili Imamate. 2018, Wednesday July 11: Mowlana Hazar Imam will attend a meeting with the Minister of Science, Technology and Higher Education and his delegation. I don't read Portuguese but it looks like this is what the newspapers are saying In the absence of any institutional news, as usual, these will be the news upon which the majority will reply. PREPARATION GOING ON FULL SWING IN DUBAI FOR DIAMOND JUBILEE PADHRAMNI OF H.H. THE AGA KHAN. The Council for Canada is pleased to inform the Jamat that Mawlana Hazar Imam will make a special and historic address to the Portuguese parliament on July 10. A video of the address will be shown in all Jamatkhanas, after evening Jamati ceremonies, on July 11. We encourage all members of the Jamat and multi-faith family members to join us on Imamat Day for this most significant and historic occasion. 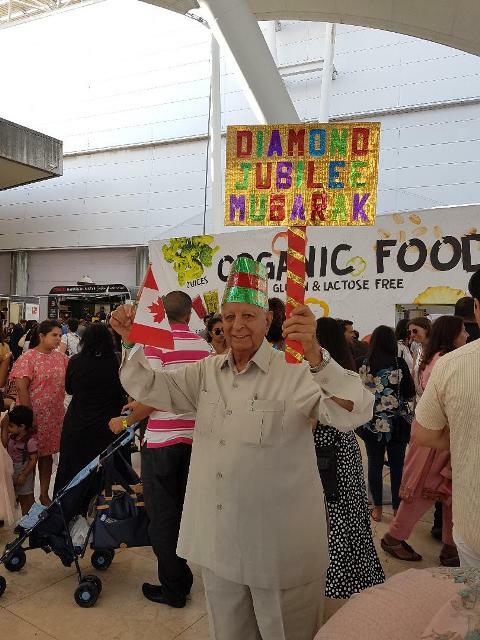 Thousands of Ismailis from Jamats around the world have gathered in Lisbon, Portugal for the launch of an historic celebration, to mark the conclusion of Mawlana Hazar Imam’s Diamond Jubilee. At the renowned Parque das Nações on the Lisbon seafront, hundreds of volunteers from numerous countries have been working tirelessly day and night, and in harmony towards a joint objective: to ensure the global Jamat can successfully come together, share experiences, and make fond memories at the conclusion of the Diamond Jubilee year. 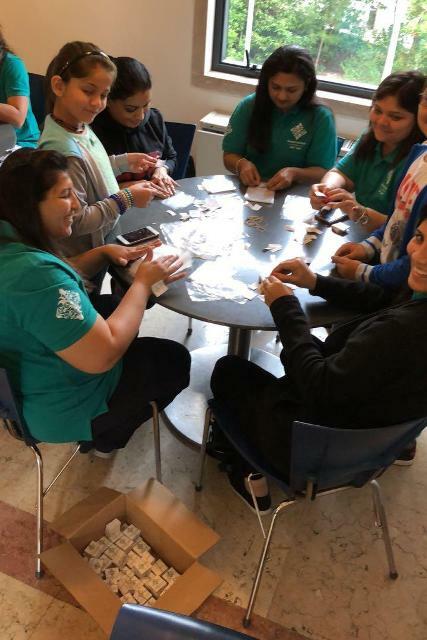 An atmosphere of excitement can be felt around the Parque das Nações, and at the Ismaili Centre, Lisbon — a hub of the Jamat in Portugal for the past 20 years — which will host tours of the building and its gardens throughout the weeklong celebration. As an international community spread across continents, Ismailis have long celebrated our unity in diversity and our cultural heritage, both historical and contemporary. Artists, musicians, dancers, photographers and filmmakers from Asia, Africa, North America, and Europe, have been arriving into Lisbon to take part in the inaugural Jubilee Arts International Arts Festival. Simultaneously, the Altice Arena is being prepared to welcome recording artists of global stature for the finale of the Jubilee Concerts series. A space called Pátio Mela will act as the central hub of the celebrations, and will include live music, performances, and interactive activities on a number of stages. 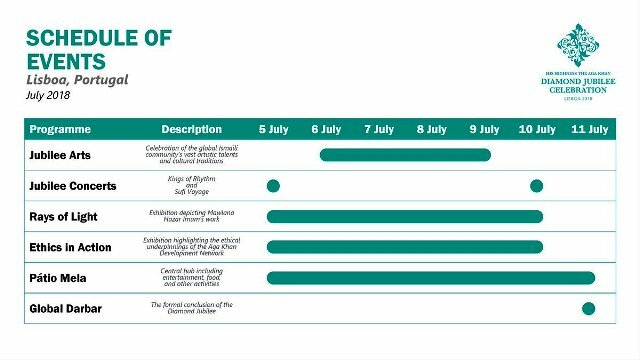 Exhibitions will also be housed at the celebration, bringing together international exhibits highlighting the positive impact of of the Ismaili Imamat and Aga Khan Development Network over a number of decades in multiple regions around the world. To coincide with the Diamond Jubilee Celebration, Mawlana Hazar Imam is expected to arrive into Lisbon on Friday 6 July. Following his arrival into Lisbon, Hazar Imam’s motorcade will drive past Parque Eduardo VII, where arrangements have been made for members of the Jamat to gather and welcome him to the country for his Diamond Jubilee visit. While the final preparations are being made to host thousands of Ismailis in Lisbon to celebrate six decades of Mawlana Hazar Imam’s Imamat, the Diamond Jubilee Celebration provides us the unique opportunity to meet and acknowledge the talent, diversity, and unity within the Jamat, for an event which will long live in the memory of thousands.